“It’s your time.” The phone call that Jawon Pass received from Coach Petrino just a few months ago when Lamar Jackson decided to take his game to the NFL. The end of another great quarterback era in Louisville… The end of our first Heisman Trophy winner’s reign… The end to one of the most entertaining college athletes to ever spin across the gridiron. The man who gave us some of the most memorable wins in our program’s history. But all great things must come to an end, and instead of being sad or hopeless we should be excited to see what the future holds. Our future is bright at Louisville, from a great player stepping up at quarterback that has now had years of experience under a Heisman winning quarterback, too upperclassmen in key positions at receiver, linebacker, and safety. So what do we expect to see at the Spring Game on Saturday? First off, I was lucky enough to watch Jawon play in high school at Carver in Georgia when Louisville played Auburn in Atlanta in 2015. The Man was amazing to watch as a high school player. He brought a spark to the field that reminds me of Lamar. I am extremely excited to see him take a team that is 100% his now and see what he is capable of early on before the season starts. He is a playmaker that is more than capable of making plays in the air or on the ground. He may not be as fast as Lamar, but running a 4.5 40 yard dash I think he is more than capable on the ground. He can air it out and punish a secondary in the blink of an eye. Jawon will be an amazing player to watch develop in the offseason and through the season, and I’m happy to say I think he will make a great impact on our team. Another key area to watch is our Receiver stable. Senior Jaylen Smith, Redshirt sophomore Dez Fitzpatrick, and sophomore Josh Johnson are a talented core of receivers that are expected to be at the top of the depth chart as of now. Jaylen Smith is a proven player that has put up nearly 1000 yards (980) and 60 catches in 10 games last year. Smith missed the first practice of the season to an undisclosed injury but we are hoping to see him lead the receiver core Saturday as one of the only expected seniors on offense expected to start as of now. At tight end, we are used to hearing the name Crum a 5th-year senior, but we may need to get used to hearing Kemari Averett much more. Averett a Sophmore is expected to be the starting tight end on paper, but expect to see Crum have plenty of playing time as with Jordan Davis. Switching up tight ends have become a major part of the offense in today’s football, and with the mindset of Coach P, the options are endless. At running back with the loss of seniors Reggie Bonnafon, Jeremy Smith, and Malik Williams expect to see Dae Williams, R-Sophmore, Colin Wilson, Sophmore, and Trey Smith, R-Junior all take handoffs from Pass in the spring game. Much in the running back is up in the air as of now, but expect by the time we step on the field with Alabama it to be figured out. Stacy Thomas is a major loss for us at Linebacker, but I expect to see 5th year senior Isaac Stewart (OLB), Freshman Robert Hicks (MLB), and sophomore Dorian Etheridge(OLB) step up. Having Stewart as a 5th year senior on the field behind the d line is a great contribution and should pay off well with the other young linebackers. To be completely honest, Cornerback is where I’m the most fearful with our team. We are extremely thin at CB and with little to go off of, the spring game will be a big stage to see how the positions are covered. Expect redshirt sophomore Rodjay Burns, and redshirt sophomore P.J. Mbanasor to lead the depth chart for us in CB. As I said, this is a major area to keep eyes on Saturday. Senior Dee Smith and sophomore C.J. Avery head up our safety positions. Smith had an excellent season last year, and an amazing bowl game. We have recruited well for the safety position so it is a possibility to see Blue, Character and Trenell Troutman. Marion Character was a huge ju-co pickup for us so I expect to see great things from him. When TreSean Smith returns from offseason knee surgery he could take the Starting spot from Avery as well, but time will tell. As far as special teams go, we return all kickers from a good lineup last year. As far as returners, your guess is as good as mine. It is very likely to see multiple players plugged into returning positions so another thing to keep an eye on. 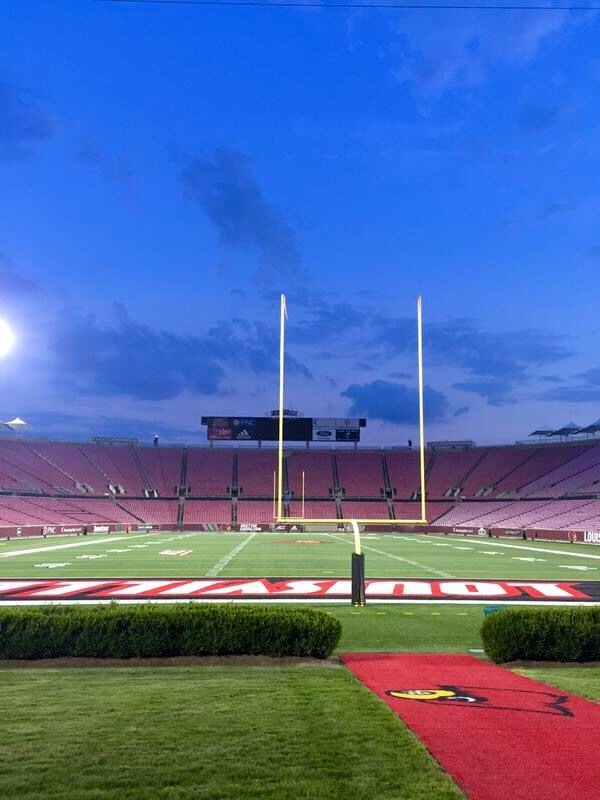 All in all the game Friday should be a great game, and a much-needed dose of football we all crave as Louisville fans. There are some positions that could come to light and make things much more clear after Friday. I hope to see all players play excellent and to see some youth step up.